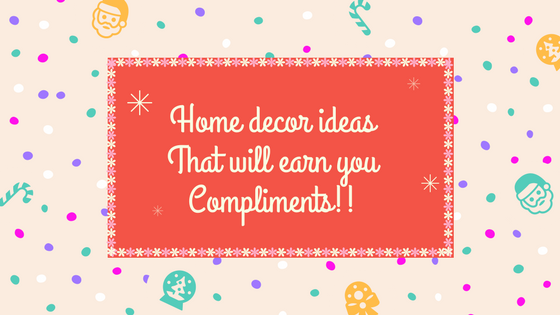 Are you looking for some awesome home decor ideas that are budget friendly as well? If this is the case then you are surely at the right place. Here you will get the best tips to transform your home into a splendid zone. With the help of the simple ideas shared here you can have a complete makeover for your place and when the guests will visit your home then they will be left stunned with your creativity. So, stay tuned as the most useful advice will be shared in the coming points. Experiment with the color theme of your home. Try different color patterns and new shades. Try combination colors; patchwork, striped lines etc. There are many wall color books and templates available in the market. Also, you can go to my go-to site, Pinterest. You can get ideas from them and then you can decide that which colors would best suit the walls. If your budget is less then you can paint the main area of your home like the drawing room. There are so many things at home that can be crafted with utmost creativity. You can make wall hangings, photo frames, decorative stuff etc. with the help of items like cardboard, silver foil, glaze paper. For making creative stuff out of waste material all you have to do is search the internet and you will get lots of brilliant ideas. You should think about decorating your home with eye catching lights. There are many alluring lights available in the local market and on online platform. You can procure budget friendly lightning arrangement and your home will get a new look. Furniture plays a big role in home renovation and if you are having a sufficient budget then think about buying some stylish furniture. If your budget is limited then you can think about modifying your existing furniture with the process of remodeling and it will involve methods like painting, polishing, scraping out the redundant parts etc. For adding a personal touch to your home you should make a photo collage. It is a great home decor idea and you can create a beautiful collage that depicts family bonding. You just need your family photos, some sort of cardboard, covering paper, glue and some other basic materials to create a photo collage. Or if you are not so fond of DIY, look for online photo collage maker tools where you don’t need to start from the scratch. Just select the template, upload your photos and within minutes, your photo collage will be ready. You can also get it framed. You can buy elegant showpieces and place them at the main areas in your home. It is a simple but highly effective home decor solution. All types of showpieces are available in the market and based on your budget, you can buy the best ones for your home. These will surely catch the attention of visitors. Get the paintings and quotations framed and place them on the main walls of your home. There is no need to buy expensive stuff. You can download art work, paintings, and quotations from the internet and then you can take a colored print out of such images on good quality paper. Once you have taken the print out then get such stuff framed and place them in different areas of your home. If you love natural surroundings then the best idea would be to use indoor plants for home decor. When plants are kept inside the home then the entire place gets filled with positive energy and it is a great way to change the look of your place. There are lots of budget friendly plants that can be grown inside the premises and maintaining them is a very easy process. Nowadays highly fashionable mirrors are available in the market that can transform the look of your home. You can place such mirrors in your bedroom, drawing room; attach them to various fixtures etc. It would be a nice experiment as far as decorating the home is concerned. The market is flooded with lovely looking wallpapers and you can get really good stuff in this segment. There are different designs, styles, sizes as well as patterns in wallpapers. These are very economical and will help in changing the look of your home in an amazing manner. These are the topmost and easiest home decor ideas that you can try. You can experiment few other things like reorganizing the bookshelves, changing the floor design, changing the window and door styles, buying beautiful looking bed sheets, pillows and curtains, carpeting the main areas etc. So depending on your budget and customized needs you can try different ideas and have a complete makeover for your home.